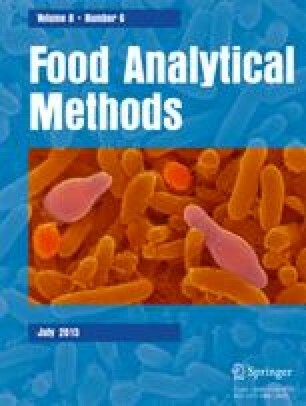 The main objectives of this study were (i) the optimization and the validation of a high performance liquid chromatographic method for the simultaneous determination of seven cholesterol oxidation products (COPs), (ii) the development of a reliable analytical protocol for their selective isolation from food samples, and (iii) the application to several foodstuffs. Baseline separation was achieved using a cyano-bonded high-performance liquid chromatography (HPLC) column and a mobile phase of n-hexane/2-propanol/acetone (97:1.5:1.5, v/v). The criteria studied for the choice of the optimum extraction procedure were the selectivity towards COPs and its efficiency in removing matrix interferences. Special attention was given to the stability of 7-keto under saponification conditions. The ideal procedure involved extraction of lipids from the food matrix with chloroform/methanol (2:1, v/v), alkaline hydrolysis with 1 M potassium hydroxide (KOH) solution in 60 % aqueous ethanol and subsequent enrichment of COPs with solid phase extraction using an NH2 column. COPs presented recoveries from 76 to 103 %. C.P.K.C. acknowledges the University of Cyprus for the support of this research. The authors would like to thank Ms. Andri Ioannou for her help in the performance of UV experiments and also for helpful discussions regarding the particular studies. Michalis S. Constantinou declares that he has no conflict of interest. Christiana A. Georgiou declares that she has no conflict of interest. Constantina P. Kapnissi–Christodoulou declares that she has no conflict of interest.